Today I decided to make a raw sesame cabbage salad! 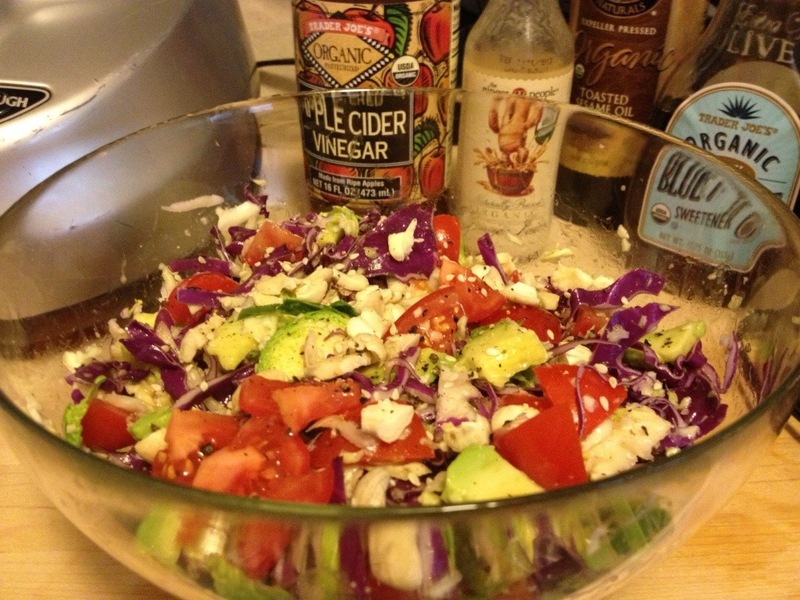 It’s a spin off Mimi Kirk’s Cool Cool Cabbage Salad. With it being the holidays, I have been everywhere but home, thus cooking or eating raw hasn’t been as easy.😁 So, I’m back at it! This salad is full of antioxidants that fight cancer and heart disease. Mix all salad ingredients together in a large bowl, except avocado, tomato, cashews, and sesame seeds. Blend all ingredients in blender if you’re using sesame seeds for the Tahini. Otherwise, whisk all ingredients together. Mix dressing into salad for desired taste. Place salad in refrigerator to allow salad to absorb dressing. When ready add avocado, tomato, cashews, and sesame seeds. Enjoy!